New York, March 20, 2012 -- Churches continue to feel the effects of "the Great Recession" of 2008 as contributions dropped $1.2 billion, according to the National Council of Churches' 2012 Yearbook of American & Canadian Churches. Membership trends in denominations reporting to the Yearbook remain stable, with growing churches still growing and declining churches still declining, reports the Rev. Dr. Eileen Lindner, the Yearbook's editor. The 80th annual edition of the Yearbook, one of the oldest and most respected sources of church membership and financial trends in the U.S. and Canada, may be ordered for $55 each at www.yearbookofchurches.org. Not all churches report their financial information to the Yearbook, Lindner said, but the downward trends are reasons for concern. The nearly $29 billion contributed by nearly 45 million church members is down $1.2 billion from figures reported in the 2011 Yearbook, Lindner said. "This enormous loss of revenue dwarfs the $431 million decrease reported last year and provides clear evidence of the impact of the deepening crises in the reporting period," Lindner wrote. In terms of per capita giving, the $763 contributed per person is down $17 from the previous year, according to Lindner, a 2.2 percent drop. The decline "took place in the context of ongoing high unemployment and a protracted economic downturn," Lindner wrote. The decline in church giving has deeply effected national churches and member communions of the National Council of Churches, many of which are dealing with severe financial exigencies. Church membership increases or declines continued as they have for several years, the Yearbook reports. "The direction of membership (growth or decline) remains very stable," Lindner wrote. "Most churches which have been increasing in membership in recent years have continued to grow and likewise, those churches which have been declining in membership in recent years have continued to decline." Changing habits in church attendance among younger generations have had a noticeable impact on declining churches, Lindner suggests. The 80th annual edition of the Yearbook reports a continuing decline in membership of virtually all mainline denominations. And the Southern Baptist Convention, the nation's second largest denomination and long a reliable generator of church growth, reported a decline in membership for the fourth year in a row, down .15 percent to 16,136,044 members. The Catholic Church, the nation's largest at 68.2 million members, reported a membership decline of .44 percent. The Church of Jesus Christ of Latter-day Saints grew 1.62 percent to 6,157,238 members and the Assemblies of God grew 3.99 percent to 3,030,944 members, according to figures reported in the 2012 Yearbook. Other churches that continued to post membership gains in 2010 are Jehovah's Witnesses, up 1.85 percent to 1,184,249 members, and the Seventh-day Adventist Church, up 1.61 Percent to 1,060,386 members. "Four of the 25 largest churches are Pentecostal in belief and practice," Linder wrote. "Strong figures from the Assemblies of God, and a big jump in the Pentecostal Assemblies of the World ... balanced against relatively modest losses from the Church of God (Cleveland, Tennessee), might suggest a continuing increase in total adherents to Pentecostal Groups." Among mainline denominations, the sharpest rate of membership decline (down 5.90 percent to 4,274,855 members) was posted by the Evangelical Lutheran Church in America. Others posting declines include the Presbyterian Church USA (down 3.45 percent to 2,675,873), the Episcopal Church (down 2.71 percent to 1,951,907), the United Church of Christ (down 2.02 percent to 1,058,423), the Lutheran Church (Missouri Synod (down 1.45 percent to 2,278,586), the United Methodist Church (down 1.22 percent to 7,679,850), and the American Baptist Churches USA (down .19 percent to 1,308,054). Information in the Yearbook is kept up to date in two regular electronic updates each year. Access to this Internet data is provided through a unique pass code printed inside the back cover. 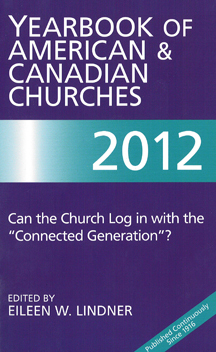 Total church membership reported in the 2011 Yearbook is 145,691,446 members, down 1.15 percent over 2011. The Catholic Church 68,202,492, ranked 1 [ranked 1 in 2011], down 0.44 percent. Southern Baptist Convention 16,136,044, ranked 2 [ranked 2 in 2011], down 0.15 percent. The United Methodist Church 7,679,850, ranked 3 [ranked 3 in 2011], down 1.22 percent. The Church of Jesus Christ of Latter-day Saints 6,157,238, ranked 4 [ranked 4 in 2011], up 1.62 percent. The Church of God in Christ 5,499,875, ranked 5 [ranked 5 in 2011], no update reported. National Baptist Convention, U.S.A., Inc. 5,197,512, ranked 6 [ranked 6 in 2011], up 3.95 percent. Evangelical Lutheran Church in America 4,274,855, ranked 7 [ranked 7 in 2011], down 5.90 percent. National Baptist Convention of America, Inc. 3,500,000, ranked 8 [ranked 8 in 2011], no update reported. Assemblies of God 3,030,944, ranked 9 [ranked 9 in 2011], up 3.99 percent. Presbyterian Church (U.S.A.) 2,675,873, ranked 10 [ranked 10 in 2011], down 3.42 percent. African Methodist Episcopal Church 2,500,000, ranked 11 [ranked 11 in 2011], no update reported. National Missionary Baptist Convention of America 2,500,000, ranked 11 [ranked 11 in 2011], no update reported. The Lutheran Church— Missouri Synod (LCMS) 2,278,586, ranked 13 [ranked 13 in 2011], down 1.45 percent. The Episcopal Church 1,951,907, ranked 14 [ranked 14 in 2011], down 2.71 percent. Pentecostal Assemblies of the World, Inc. 1,800,000, ranked 15 [ranked 17 in 2011], up 20 percent. Churches of Christ 1,639,495, ranked 16 [ranked 15 in 2011], no update reported. Greek Orthodox Archdiocese of America 1,500,000 , ranked 17 [ranked 16 in 2011], no update reported. The African Methodist Episcopal Zion Church 1,400,000, ranked 18 [ranked 18 in 2011], no update reported. American Baptist Churches in the U.S.A. 1,308,054, ranked 19 [ranked 19 in 2011], down 0.19 percent. Jehovah’s Witnesses 1,184,249, ranked 20 [ranked 20 in 2011], up 1.85 percent. Church of God (Cleveland, Tennessee) 1,074,047, ranked 21 [ranked 22 in 2011], down 0.21 percent. Christian Churches and Churches of Christ 1,071,616, ranked 22 [ranked 23 in 2011], no update reported. Seventh-day Adventist Church 1,060,386, ranked 23 [ranked 24 in 2011], up 1.61 percent. United Church of Christ 1,058,423, ranked 24 [ranked 21 in 2011], down 2.02 percent. Progressive National Baptist Convention, Inc. 1,010,000, ranked 25 [ranked 25 in 2011], no update reported. For more information, or to purchase a copy of the 2011 Yearbook, see www.yearbookofchurches.org. Yearbooks from earlier years may be available at a discounted price at 888-870-3325.